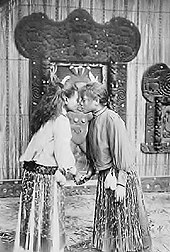 The traditional Māori greeting, the hongi is performed by two people pressing their noses together; some include, at the same time, the touching of foreheads. The greeting is used at traditional meetings among Māori people, and at major ceremonies, such as a pōwhiri. It may be followed by a handshake. In the hongi, the ha (breath of life) is exchanged in a symbolic show of unity. Through the exchange of this greeting, one is no longer considered manuhiri, a visitor, but rather tangata whenua, one of the people of the land. When Māori greet one another by pressing noses, the tradition of sharing the breath of life is considered to have come directly from the gods. In Māori mythology, woman was created by the Gods moulding her shape out of the earth. The god Tāne embraced the figure and breathed into her nostrils. She then sneezed and came to life, creating the first woman in Māori legends, Hineahuone. The hongi may be performed by Māori and non-Māori, and between New Zealanders and foreign visitors. Several royals have been greeted with the hongi during visits to New Zealand, including: Prince Charles; Diana, Princess of Wales; Prince William; and Prince Harry and Meghan, Duchess of Sussex. U.S. Secretary of State Hillary Clinton was greeted with a hongi on a November 2010 visit to Wellington. Former U.S. President Barack Obama exchanged a hongi with New Zealand Prime Minister Jacinda Ardern during a visit to the country in March 2018. ^ a b c Salmons, Matthew (17 September 2017). "Hongi, our national greeting". Stuff.co.nz. Retrieved 1 November 2018. ^ The Editors of Encyclopaedia Britannica. "Maori – Maori Culture In The 21st Century". Encyclopædia Britannica. Retrieved 1 November 2018. ^ a b c d Māori ki Te Whare Wānanga o Ōtākou. "Pōwhiri". Dunedin: University of Otago. Retrieved 1 November 2018. ^ Derby, Mark (September 2013). "Ngā mahi tika - Welcome and hospitality: Origin of the hongi". Te Ara: The Encyclopedia of New Zealand. Retrieved 8 September 2017. ^ "Maori warriors greet Prince Charles and Camilla in New Zealand". The Telegraph. 7 November 2015. Retrieved 1 November 2018. ^ "Remembering Princess Diana 20 years on". Gisborne Herald. 31 August 2017. Retrieved 1 November 2018. ^ Boyle, Danny (12 October 2017). "Prince William shares hongi greeting as he honours Kiwi Passchendaele soldiers". The Telegraph. Retrieved 1 November 2018. ^ "Meghan praises first female vote in speech". BBC News. 28 October 2018. Retrieved 1 November 2018. ^ "Pictures of the Day: 23 March 2018". The Telegraph. 23 March 2018. Retrieved 1 November 2018.